I love “traditional” granola, but I don’t love that it has to be super high in sugar and fat in order to clump and get crunchy. 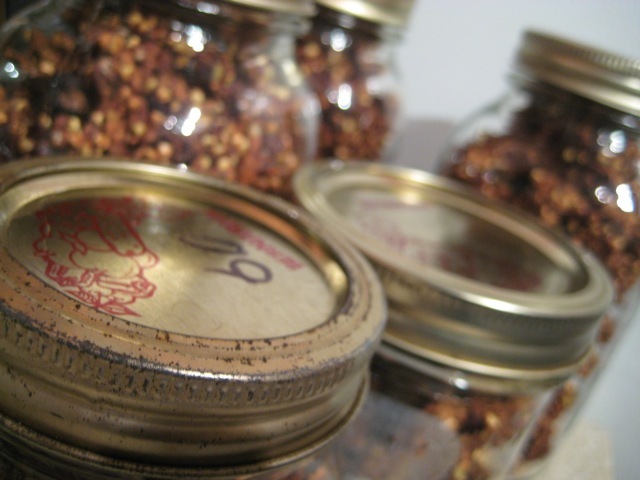 (Go ahead – read the label of your favourite boxed granola.) So I was thrilled when I discovered raw granolas, which are typically based around buckwheat and clump due to their time in the dehydrator. 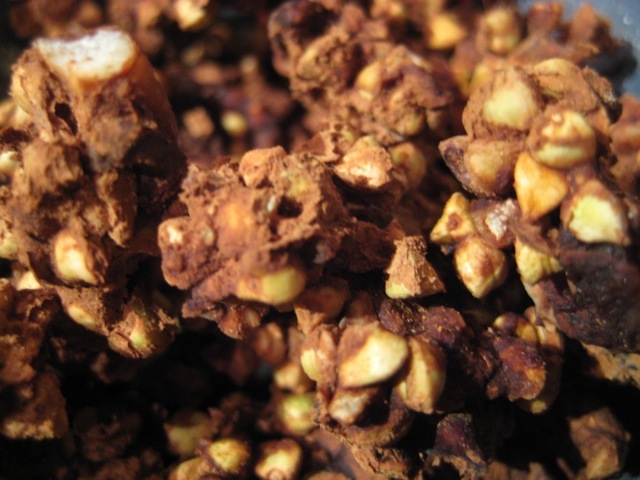 Buckwheat, despite its name (and here I feel like I’m repeating a million other articles, sorry if you know this already) isn’t related to wheat and isn’t technically a grain at all – it’s a seed. (Although I have to say, I’m no biologist, but the line between grain and seed seems odd. I mean, you can plant both of them to get another plant.) In any case, it’s gluten free so safe for those with celiac or other gluten-related problems, and it’s very nutritious and high in protein. Toasted whole buckwheat is common in Eastern Europe but the buckwheat we’re talking about today is untoasted. 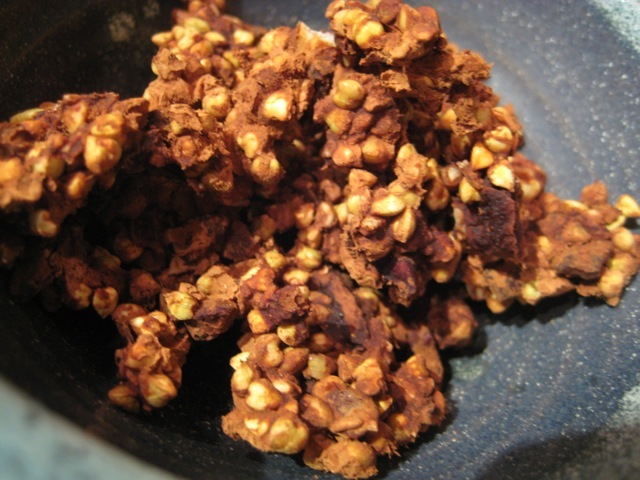 You can tell them apart in the store by their colour – toasted buckwheat is a lot darker. 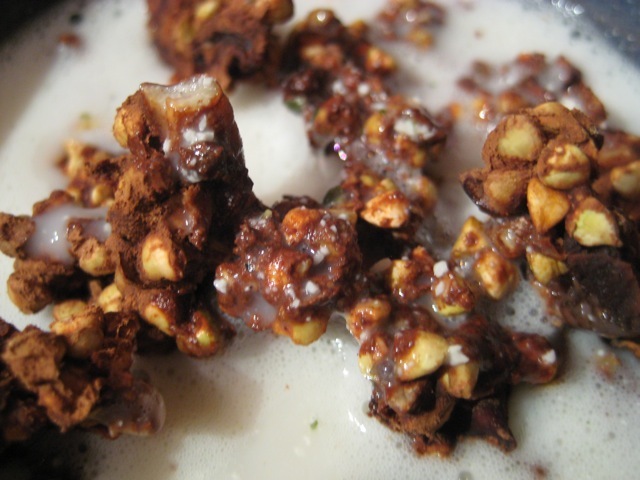 Your basic raw granola recipe involved soaking buckwheat overnight and then rinsing well (it gets a slimy texture naturally – don’t worry about this, just rinse it off) and combining with other ingredients, including a liquid sweetener, so that a sticky almost-dough (which will be crumbly) is created. Then it’s dehydrated until dry and crunchy. 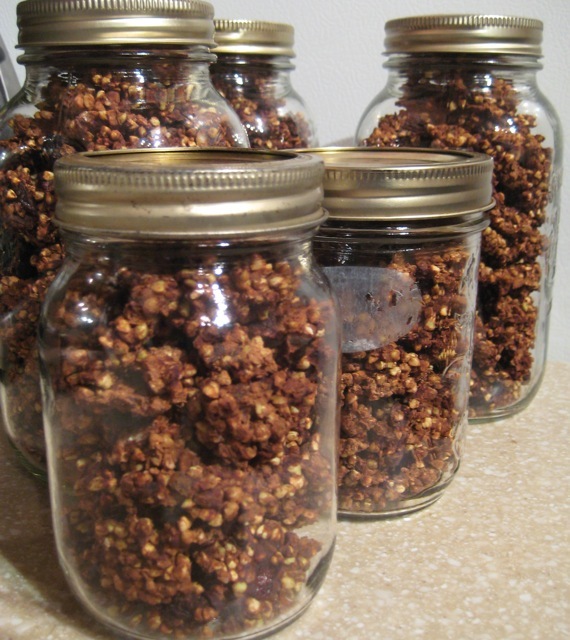 This time, I reproduced a recipe from Live – if you live in Toronto, you might have seen their packaged granolas for sale at places like Fiesta Farms and The Big Carrot. I recently downloaded their recipe e-book so I could make things like this and save a bit of money. (Although fairly priced due to quality ingredients and a lot of effort, packaged raw foods aren’t cheap.) 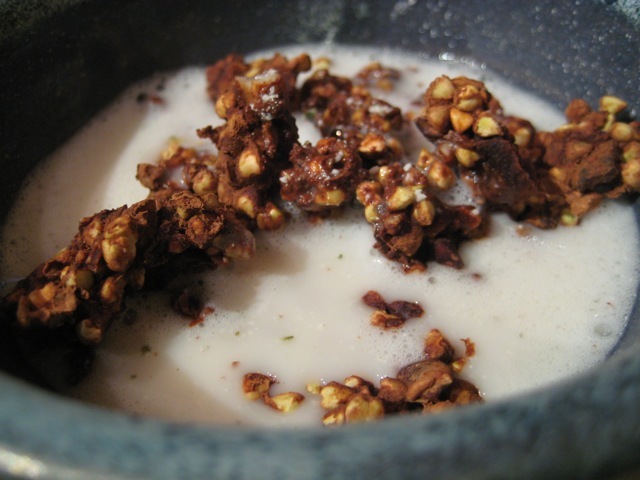 It’s a chocolate granola (yum!) 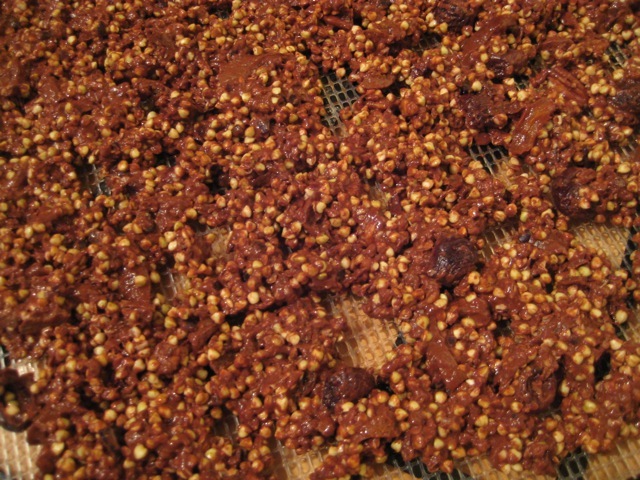 with tons of raw cacao powder and cinnamon, dried (but soaked before using) apricots and cherries (my sub for their raisins) and pecans (my sub for their walnuts). As a sweetener I used maple syrup. And ready to eat! I serve with homemade hemp milk. Now I’m ready for the week month. The restaurant is small, and cute. Street parking is free after 5! And my first impression after reading the menu was that I wanted to try one of everything. And I tried. 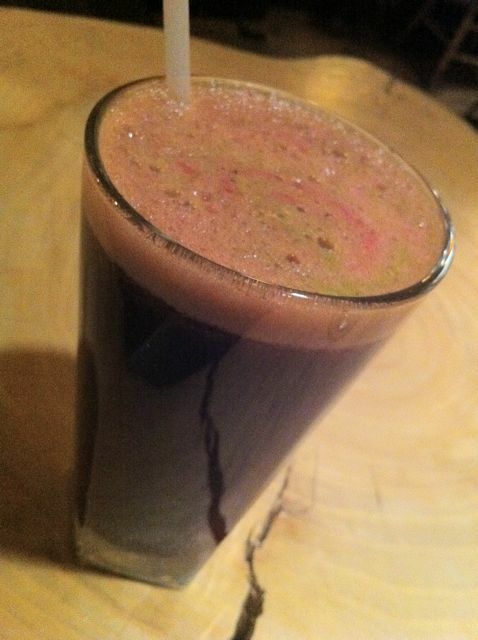 First, the Muddy Waters juice: kale, apple, celery, beet, lemon and parsley. As the name suggests, it’s not the prettiest of juices, but it has its own special beauty. 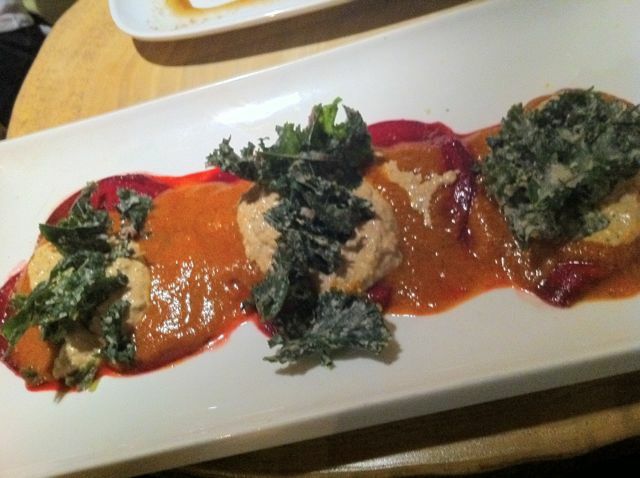 Appetizer: the beet ravioli, filled and topped with a cashew cheese and red pepper marinara sauce. 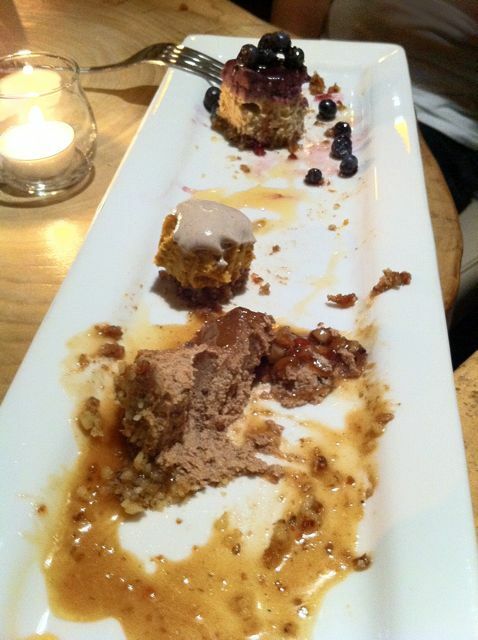 And this is the point where I caution you that portion sizes aren’t small at Raw Aura. I could have stopped here and been completely satisfied (with a bite of dessert at the end, of course.) I loved the kale chips on top – this was my favourite dish of the night. 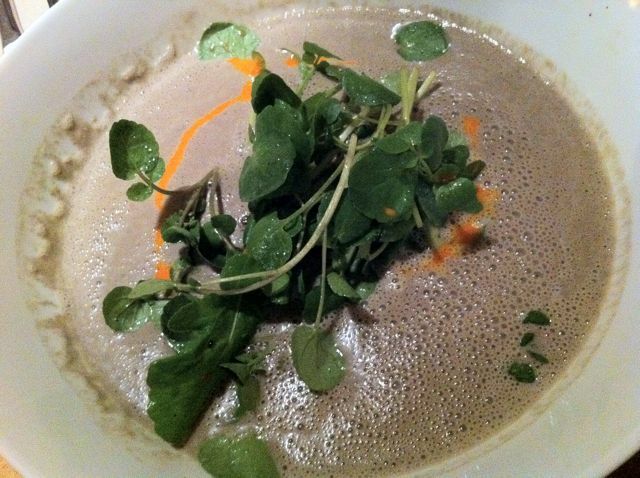 One of the nightly specials was a mushroom soup. I’ll go for anything with mushrooms in it so of course I ordered it. It came topped with watercress, which was delicious and pretty but kind of a pain to eat unchopped. The soup was a lot simpler and milder in flavour than the ravioli so while delicious, it might have been better served first. What did my friends order, you ask? 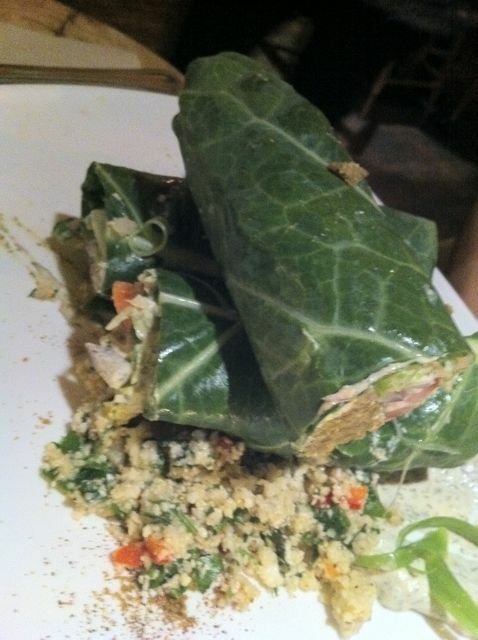 One had the falafel, made of sprouted chickpeas and wrapped in collard leaves, with a cauliflower tabouli. And chose the miso soup as her main. 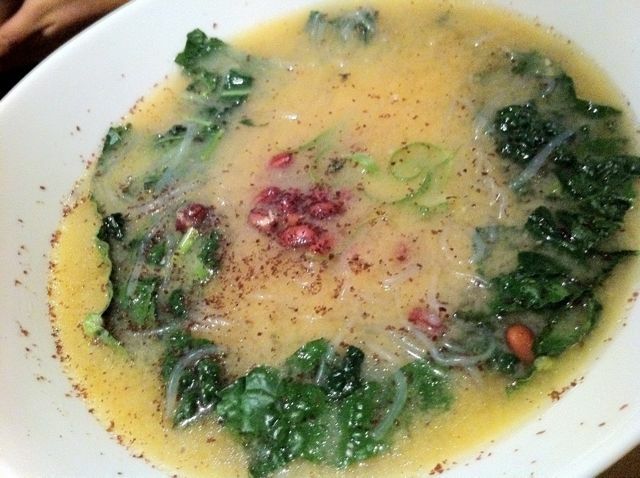 It’s a hearty one, with kale, kelp noodles and sprouted beans. For dessert we shared a platter of three selections. 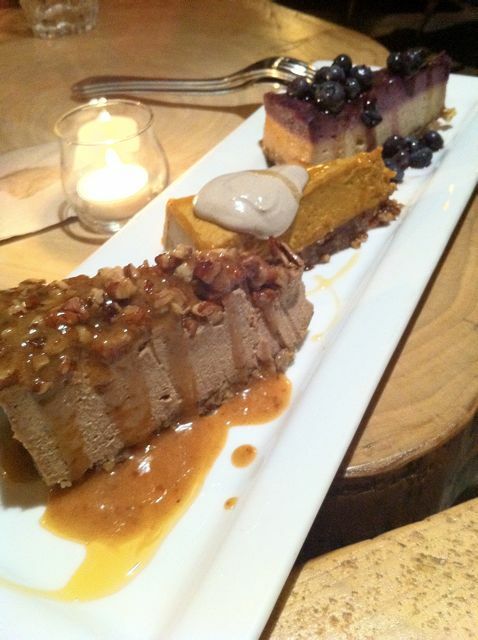 From top: blueberry cheesecake, pumpkin pie and pecan pie. We were all completely stuffed, but we were up to the challenge. 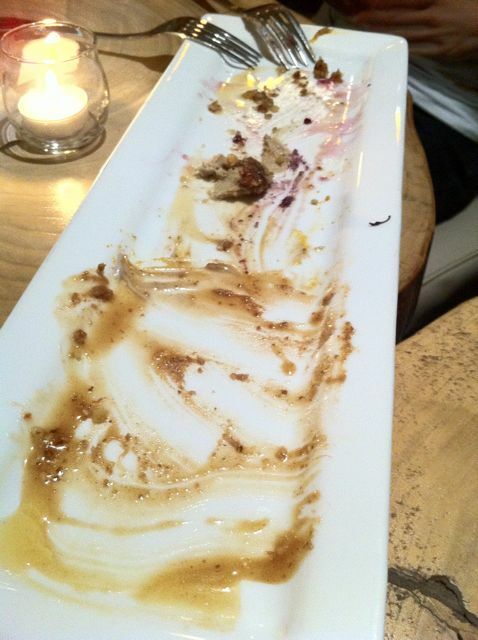 The winner was the pecan pie, but as you can see, we managed to polish them all off. The verdict? 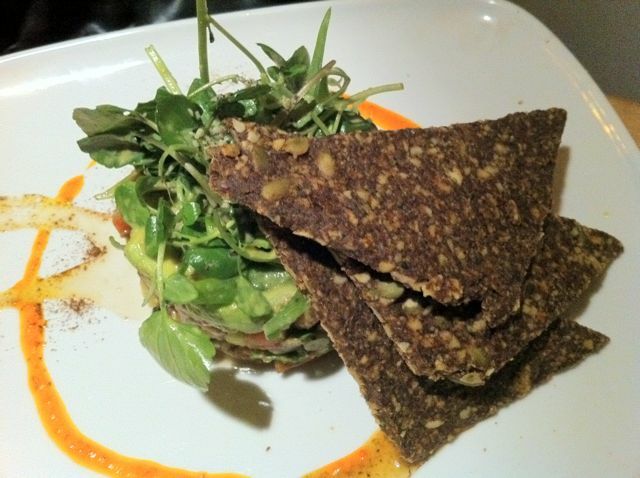 All three of us agreed that while all the raw restaurants we’ve tried are excellent in their own rights, Raw Aura has the best raw food in the city – and it isn’t even in the city. Thanks, Doug! Totally off-topic with the raw (and not local) stuff, but here we go. Like many people, I’m a bit of a sweets- and choco-holic, but I prefer not to eat a lot of fatty, sugary sweets if possible. (Read: I keep them out of my house as much as I can for a very good reason.) 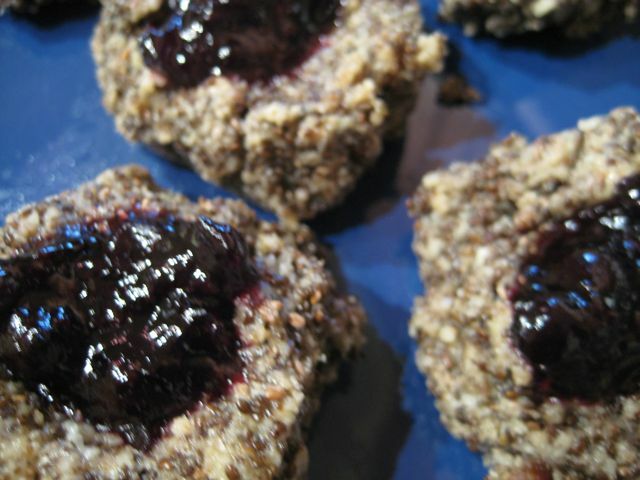 But that doesn’t mean I don’t want dessert, so I’ve taken to making raw chocolate puddings for a yummy treat. They’re still somewhat sugary, and high in (unprocessed plant-based) fat, but they’re also full of nutrition and don’t make me feel gross after I eat them. The first is a chocomole, from the blog Choosing Raw. 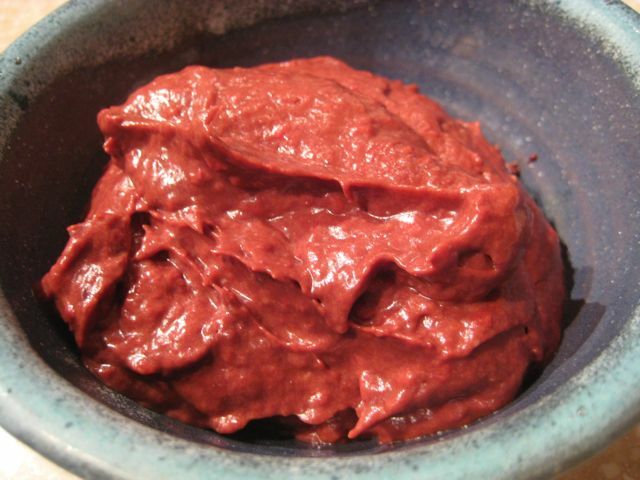 Basically, it’s a mixture of avocado, cocoa or raw cacao powder (I like Green & Black’s), dates (Medjool blend up the best), vanilla and a bit of water, processed until smooth. The avocado sounds weird, I know, but it really is good. You’ll note mine isn’t as smooth as Gena’s, but maybe I was in too much of a hurry – extra time in the food processor really does help. The second, which I tried for the first time tonight, is a chocolate coconut pudding. The creamy base is young coconut meat and water (I used plain water because I’d already drunk all the water from my coconuts), blended up with cocoa powder, vanilla and a sweetener (I used a blend of agave syrup and local honey). This one I did in the blender and I ran it for quite a while, so it got fairly smooth. The taste was shockingly reminiscent of the classic pudding cups, and not as coconutty as you’d think, and it disappeared pretty fast. Are green smoothies really that magical? Sometime in the summer, I found out about the “green monster” trend – these are smoothies with green leafy vegetables added, often spinach. So I started adding spinach and occasionally other greens to my smoothies for added nutrition, with mixed results and a great degree of dislike from my significant other. I’ve made it a habit to add greens most days now, and I find I don’t notice them as much as I did when I started. But I didn’t think much of it other than as a way to add more green veggies to my diet, and I was basically adding the greens to my standard smoothie recipes – banana, milk (nut these days), fruit, protein powder, etc. I recently got a copy of a book entirely about green smoothies: Green Smoothie Revolution by raw-foods activist/author Victoria Boutenko. She’s pretty fervent about the value green smoothies can have for your health – the gist of her theory is that we are meant to eat a large amount of green leaves every day (she points out how many greens chimpanzees eat) and that by blending them, we are a) making them easier to digest, translating into needing less greens for similar nutrition, and b) making them easier to eat, as most of us have a hard time eating bucketloads of raw kale salad. On the one hand, I’m a born cynic. On the other hand, this makes a lot of sense. So I’m going to try adding some basic green smoothies to my diet and see how I feel. Tonight I did young coconut/papaya/banana/arugula – kind of a cheat because coconut meat adds creaminess, but delicious and very hydrating. Are you into green smoothies? What are your favourites? Edited to add: My favourite green smoothie I’ve ever had was at Crudessence in Montreal. But the Tropical Green at Rawlicious is a close second.